On Sunday, Nick Gillespie tweeted out that Joseph Stalin was the leader of “Stalinism,” and not communism. While obviously absurd, should we really be surprised? He has a history of making flawed claims. For example, Gillespie has been unfair in his past criticism of the pioneers of modern libertarianism such as Murray Rothbard. Now it appears he also subscribes to the same exact fallacy held by those such as Noam Chomsky, which argues that no communism existed after the Russian Revolution of 1917-1918. Stalin took the brutality and centralization to new heights upon becoming the Soviet Union’s new leader in 1924. To what degree does Stalinism differentiate from communism? The answer is none at all. Stalin rose to power as the General Secretary of the Communist Party, and he was notably more radical than the old party leadership. Socialism, as argued by Karl Marx himself, was the means to arrive at communism. With the destruction of capitalism being a priority. Marx was clear in explaining how communism would be reached and what measures would need to be taken. His ten planks outlined at the end of Section II in The Communist Manifesto (1848) resonate precisely with Stalin’s policies that led to so much death and destruction. The abolition of private property, a heavy and progressive income tax, centralization of credit in the hands of the State, and centralization of communication in the hands of the State were just a few tenants of his plan. In other words, the State was the new God and needed to be in order to fulfill the end result: communism. 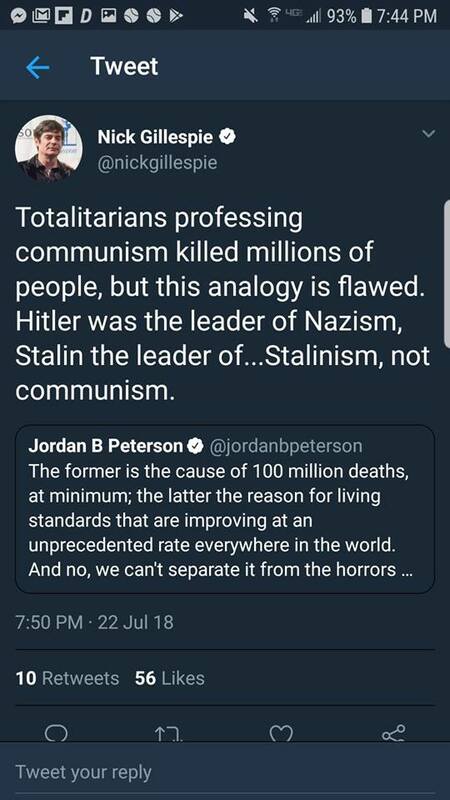 Jordan Peterson was originally responding to Owen Jones’ tweet that said “What is communism, can we separate it from the horrors of Stalinism – and what about the crimes of capitalism?” J.B.P. is correct in placing the blame on communism. If Nick Gillespie is incapable of recognizing Joseph Stalin as the murderous communist dictator he was, he is not to be taken seriously on the subject.